We’re invited into the playful relationship with Desmond’s brother, loving relationship with his mother, and difficult one with his father. – He loves his brother, though almost killed him in a play fighting accident. This is one of the things that shapes his views on fighting and killing. While in this crisis with his brother, we see Desmond looking at a poster in his house with both the Lord’s Prayer and the 10 commandments, focusing on commandment #6, Do not Kill. Demond seemed to always have compassion for others. While cleaning the church windows, he hears a noise, rushes out to see, and help, as someone was struck by a car. He saves his life and this starts his interest in medicine. – This also leads him to meeting his future wife, Dorthy. This is of course the years of WW2. Americans are enlisting to war. Desmond’s brother enlisted. And Desmond, makes the choice to enlist as well. Doss ends up in prison for a few days, as they wait to give him a trial, and attempt to send him home. He missed his wedding because they didn’t let him go home for the weekend. His lieutenant brings his fiancé to him, to try and convince him to give up this foolishness. During his Trial, Desmond’s Father brings the leading officer/judge a letter reminding them of the constitution; a constitution that was written to give people freedom of choice. 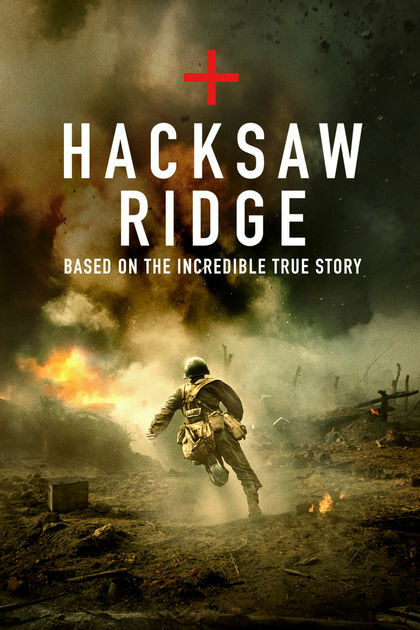 Desmond wins the trial, is allowed to go back to the army, and the story leads us to Okinawa, Japan, and the battle on Hacksaw Ridge. His parting sentence? You are free to enter into the hell fire of war without a single weapon to protect yourself. What proceeds to happen in the final 45 min of the movie is one of the greatest acts of courage & conviction you’ll ever see. Desmond, true to his values, does not use a weapon, but proceeds to risk his life to save the life of others. After a day of fighting, when the surviving soldiers leave the Ridge to go back to camp, Desmond stays, and going back and forth, bringing wounded soldiers again and again, lowering them down to camp to be cared for. During this time he ask’s God, ‘what do you want from me?’ Then hears the cries of his brothers, and knows what to do – help them. His prayer that whole night, “Help me save one more. Please Lord, help me save one more.” He helped more than 75 soldiers that night. AND… “Let’s get this soldier to a hospital bed”. This is significant, as earlier in the story, Doss tells that same lieutenant, “While everybody else is taking lives, I wanna be saving it…With the world set on tearing itself a part, it doesn’t seem like a bad idea to put it back together.” He was laughed at a criticized – now he’s called a solider. Live out your convictions…your values…your heart felt principles. Decide how you want to be known and who you are…you have nothing else. Have an answer for everyone who asks about the hope & faith you have. Peace, and non-violent confrontation, even in the midst of impossible situations, is valuable and life changing/saving. Isaiah 2:4, Micah 4:3 They will beat their swords into plowshares, And their spears into pruning shears. Nation will not lift up sword against nation, Nor will they learn war anymore. – Why do we have to wait for someone like Doss to save 75 people before we can appreciate his values and principals? – War movies are always about the one with the most guns while this story is about the guy with no guns or weapons. – All we can do is help one person at a time and leave the results up to God.